Shreyas Talpade’s direction is very nice. He has kept the entertainment quotient high consistently. On the whole, Poster Boys is a thoroughly engaging entertainer and has the potential to do well at the box-office. But lack of promotion will come in the way of realisation of its full potential. Either way, the film’s hastily served social cause around a ridiculously overdone climax refuses to be taken seriously. Especially when the slogan declares — Na le panga. Andolan nanga. Poster Boys’s school play enthusiasm never aims above a low IQ comedy expecting us to guffaw at the sight of Bobby, his wife and kids wearing the same set of bright yellow, Hello Kitty-print pyjama suits. I half-smiled to that, will you? The best part about Shreyas Talpade’s unsuspecting debut film as a director is the fact that he doesn’t try too hard to make his characters look or sound funny. They are just common people stuck in an uncommon situation and must deal with it. Their ways to prove their innocence are as ineffective but that makes you identify with their trauma. This dramedy that revolves around men who unknowingly promote ‘Bina taka nasbandi operation’ is a light-hearted and clever take on the population problem that plagues our nation. Shreyas Talpade’s story is novel and makes for an entertaining film. Bunty Rathore and Paritosh Painter’s screenplay is effective overall, despite an average beginning. The fun element never stops and that is quite a feat. 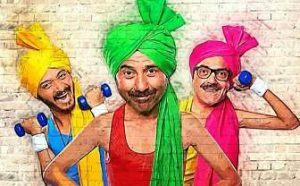 On the whole, POSTER BOYS manages to tickle your funny bone and also neatly embeds a social message. Sadly the lack of promotions and limited shows with odd timings may end up playing spoilsport. However the positive word of mouth may translate into decent footfalls over the weekend as well as the weekdays. The world turns upside down for three men, Vinay Sharma (Bobby Deol), Arjun Singh (Shreyas Talpade) and Jaagavar Chaudhary (Sunny Deol),when they find their pictures on a poster promoting ‘nasbandi’ vasectomy. And then, starts their journey of getting humiliated by their families and society; rebelling against the system which landed them in this confusing mess in the first place.